A recently finished English Functional Skills course has delivered more fantastic results with a strong partnership between Axia Solutions, XPO logistics and the Communitas Union. Nearly half of the Eastern European warehousing and distribution workers who improved their English skills last year with the help of the Community union at the new XPO Logistics / Adidas site in Bedford have taken on new roles with the company and the union. Of the 26 learners who completed the 16-week English for Speakers of Other Languages (ESOL) programme delivered by Axia Solutions in the autumn, 11 have used their new-found confidence and skills to move up the workplace ladder. Two have won promotion to systems administrators, one has become a warehouse administrator and four have risen from operatives to step up trainers. In addition, two former operatives (including one of the new step up trainers) are now working as manual handling instructors, while another has become a mechanical handling equipment (MHE) instructor. Lastly, two more learners have take on greater responsibility – one as a team leader, the other as a stock administrator. In addition, three have become health and safety reps – which they could not have done without improving their English skills – while one of the trio has also put himself forward as a union rep as well. Communitas Project Officer Mick Brightman and XPO Training Manager Matt Betts organised the course around the shift times on site, so that learners could either come in an hour early once a week to learn before their shift started or stay an hour later when their shift ended. “The students gave us really positive feedback and all 26 of them ended up with a qualification either at their assessment level or one above it, which was fantastic.” says Mick. 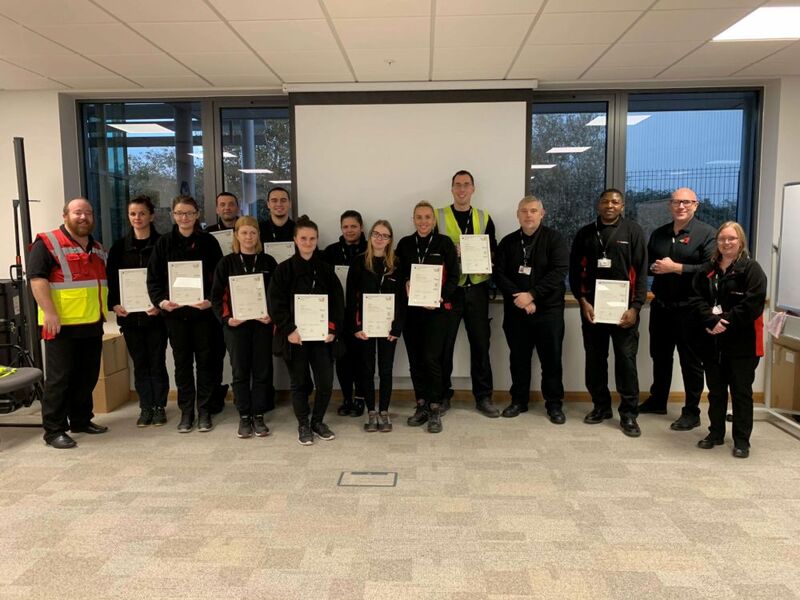 Picture – 11 Colleagues from XPO Marston Gate receive their framed certificates from their English Teacher and members of the XPO leadership team. Community, XPO and Axia are looking to run a fresh ESOL programme in Bedford from April this year and already have 30 colleagues signed up to participate.